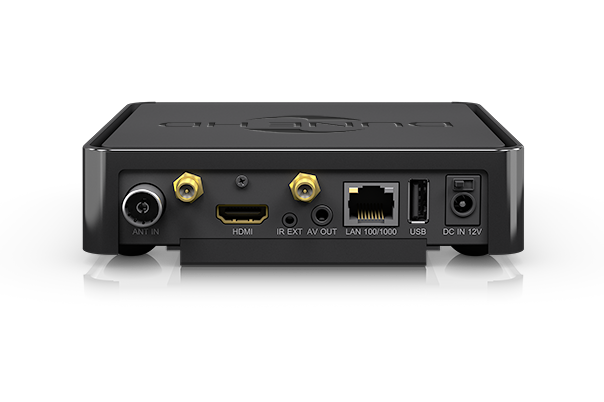 Dune HD SOLO 4K is a new compact and powerful media player, affordable solution supporting 4K Ultra HD video playback and innovative HEVC (H.265) video codec. The model can play virtually any content from local and Internet sources with the best quality. Built-in DVB-T/T2 tuner provides possibility to watch digital terrestrial free-to-air TV channels. SOLO 4K is based on the newest SMP8758 processor - the first and the only Hi-End processor by Sigma Designs with real 4K Ultra video support. The new ARM-based media processor is 4(!) 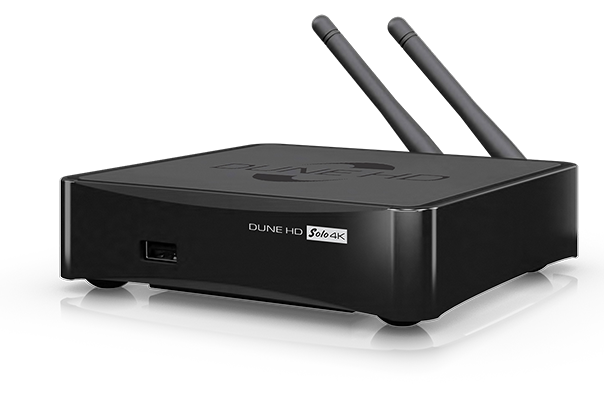 times more powerful than processors used in previous Dune HD media player models. The new model can both play 4K content and upscale any content to Full HD and 4K. Professional-grade “VXP” video processor ensures the best picture quality. The newest video encoding standard with 10 bits per color component (rather than the typically used 8 bits) is supported for HEVC video playback. It gives possibility to reproduce more than 1 billion colors, which is 64 times more than before. The new model features a new possibility to play Blu-ray images not only with simple “BD Lite” mechanism, but also with full Blu-ray menu support, which is a unique possibility for devices of this class. Both 2D and 3D Blu-ray content is supported. SOLO 4K has dual band Wi-Fi 802.11b/g/n/ac (2.4 GHz + 5.0 GHz) with 2T2R mode and two antennas. 1Gb Ethernet port is available for fast wired data transfer. These powerful network interfaces give possibility to playback heavy high bitrate content both via wires and by air. The media player has two USB ports for external storage devices and a 2.5” SATA HDD rack with hot-swap support. Solo 4K preserves all the traditional Dune HD functionality of high quality video and audio playback. Proper support of true “Hollywood” frame rate (23.976 fps) ensures perfect smooth playback without any stuttering or lost frames. The new model supports all modern Hi-End audio formats as well. Built-in Z-Wave controller option will be also available for smart home application.